The Lhasa Apso has a long, sturdy body with a long, flowing coat, giving it a dignified, lion-like look. Small but strong, yet not particularly athletic, the Lhasa Apso dog breed is very friendly and loyal to his owner and other family members. The Lhasa Apso originated in Tibet. Lhasa Apsos range from 10 inches to 11 inches. Lhasa Apsos range from 13 to 15 pounds. Lhasa Apsos are typically black, white, brown, gray, cream or particolor. Lhasa Apsos have heavy, straight and long flowing coats. Regular grooming is essential to keep the Lhasa Apso's coat from tangling. The Lhasa Apso is a very friendly and intelligent dog breed. Suspicious of strangers, the Lhasa Apso makes an excellent watchdog. The Lhasa Apso is considered to be a consistent dog. 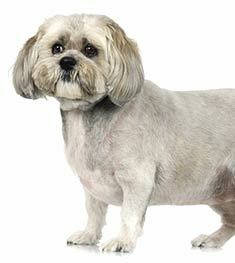 The Lhasa Apso is susceptible to hip dysplasia and skin, kidney and eye problems. The expected life span of the Lhasa Apso is 12-14 years. Lhasa Apsos do well in apartments because they tend to be very active indoors. A walk each day will provide ample exercise for this gentle dog breed. The Lhasa Apso is in the Non-Sporting group. Hard to believe this small, beautiful dog was bred to be a watchdog, but that's just what Tibetan Buddhist monks had in mind when they developed the Lhasa Apso. These dogs were meant to live inside the monastery and warn the monks of any intruders who slipped in. Named after Lhasa, the capital city of Tibet, the breed's name means "long-haired Tibetan dog." "Apso" translates as "bearded," and this breed does indeed have an impressive bearded face. The dog is featured on the Tibetan flag and are thought to bring luck to their families. As the Lhasa has been bred in Western countries, the breed has lost some of the distinctive appearance that was required for life in the rugged mountains of Tibet. A movement called the Tibetan Line Breeding Programme was founded to preserve the original characteristics of the breed through selective breeding. What does a Lhasa Apso look like? The American Kennel Club breed standard for the Lhasa Apso calls for a small dog, standing 10 - 11 inches at the withers, or the highest point on the back of the dog, and weighing between 12 and 18 pounds. The abundant fur may be of any color or a mixture of several colors, and should be straight and dense. The fur on the ears and beard may have tips darker than the rest of the body, but this is not a requirement of the standard. The primary function of the dog's fur is to provide protection and insulation from the mountain cold. As such, the hair fully covers the dog, including his feet, and usually extends almost to the ground. Some hair should cover the face to protect the eyes. The strong eyelashes will keep the hair from blocking the dog's vision. The coat color will get lighter as the dog ages. The coat texture should be neither woolly nor silky. Generally, the Lhasa has dark brown eyes and a black nose, although the rust-colored variety may have a brown nose. The tail is carried over the back in a corkscrew shape and may have a kink at the end. The soft undercoat will shed out once a year, but the outer coat generally does not shed. The dander trapped on the hairs of the undercoat may cause problems for those with allergies. Some Lhasa people keep their dogs in a "puppy clip" rather than deal with the grooming requirements of a long-haired dog, but purists insist this is doing the dog an injustice by removing his insulation. 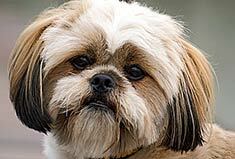 The Lhasa Apso is very loyal toward his family, but wary of strangers. Of average intelligence, the dog is about average in his or her ability to learn obedience commands. They do love to please their families, so training with lots of praise and appreciation for good performance is a good strategy. Due to their mountain roots, they like to hike and climb, and you may find your Lhasa perched atop some of your furniture. Tibet also contains many mountain caves, so Lhasas like to burrow into small areas where they can make their den and feel most safe. These are dogs that might like a dog bed that has a flap cover so they can burrow into the pillow and cover themselves with the flap. The breed standard describes a dog that is both gay and assertive. They are playful, and will show their love by rubbing their heads against their family members or sitting on their feet. In order to fulfill their role as watchdogs, Lhasas must be calm, alert, and independent. They must be able to decide on their own when danger is imminent. Lhasas are able to move very quietly and bark very loudly, giving them the advantage of sneaking up on prowlers without detection, but allowing them to alert their loved ones of impending danger. People who live with Lhasas must be careful to make sure they know where the dog is before moving through a room so they do not step on this quiet canine. How do I groom a Lhasa Apso? To groom any long-haired dog, start by lightly misting the dog with a de-tangling spray to prevent hair breakage. Pin up the top several layers of the coat, then brush out the bottom layer, starting from the bottom of each hank of hair and working your way up to the end of the hair coming out of the dog's skin. When one layer is complete, take the next layer down from the clips and mist then brush that layer before continuing on to the next. When all of the tangles are out, stand your dog up and position yourself behind him or her. Use a knitting needle or the last prong of a comb, draw a line through the dog's fur from the nape of the neck to the tail. This will allow you to create a straight part with the dog's fur hanging correctly down both sides of his or her body. The fur between your dog's foot pads should be clipped frequently to prevent it from matting and causing the toes to spread. Hair growing in the ear canals should be plucked to prevent the trapping of moisture in the ears which can lead to infection. Grooming should be done at least weekly, if not daily. Grooming should begin at quite a young age to get the dog used to being poked at so he or she will not be afraid of the grooming table later on. Is the Lhasa the breed for me? If you are looking for a small dog who is not yappy, but makes a great companion, the Lhasa Apso may be just what you are looking for. The breed will do well with children and other pets if socialized early. If you are leery of getting involved with a dog who has intense grooming requirements, you may want to look at other breeds. Find Lhasa Apso Puppies with our Free Breeder search!